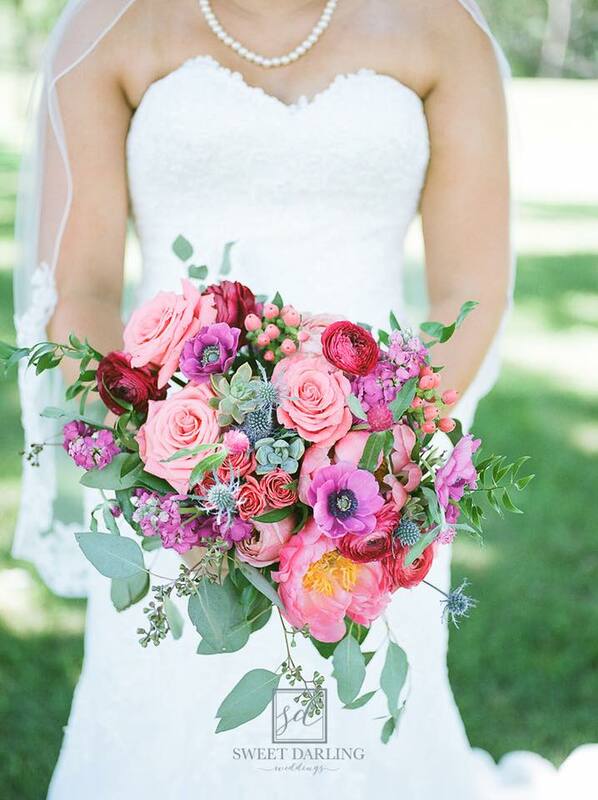 It may be hard to predict what a bride will want for her wedding day, but is likely to include gorgeous flowers. Barn weddings with rustic materials have been popular for years, but floral designers are seeing a shift in 2019 towards a 1970s bohemian style, and an elegant industrial style. Here are some field reports on what brides are asking for this year. Pastel blooms have passed their prime. Brides want brighter and bolder flowers with red, orange and jewel tones. Classic and elegant pale pinks, blush, taupe, and off-white flowers are replacing the traditional white blooms. Coppers and silvers are replacing golds. Brides are opting for large bold flowers in a minimalist design rather than flower-packed arrangements. Protea is a tropical that comes in an array of textures and colors, and makes a statement as a single blossom. Peonies will continue to be popular for weddings because of their soft textural layers and pretty colors; however, peonies have a short window of availability, lending well to the late spring bride. Greenery continues to be popular but care-free pampas grass may be the new alternative. "With social media and Pinterest, we're finding that brides are much more knowledgeable about the varieties they really love," says local floral designer, Candice Hart. "Also, with the local flower movement going strong, many brides are opting for blooms that are in season on their wedding date, as opposed to shipping a peony from Chile in October, for example"
Fluffy dinner plate dahlias are very popular in late summer and fall. "We can never seem to grow enough dahlias," says local flower farmer, Audra Wyant of Lexington. "They come small and large, and in a wide variety of colors from dusty pinks to deep, bold reds. They are amazing in the field and even more stunning in a bouquet; and they last longer when they are purchased locally." Brides may opt for a bohemian feel by wearing a floral crown on their wedding day with dramatic, cascading, and wild looking bridal bouquets. Or she may select something smaller and minimal. Out are uniform bridesmaid bouquets and boutonnieres in favor of several different but cohesive arrangements. Responding to the emerging bohemian styles, Wyant says "we planted 100 lavender plants last year. We utilize it in bouquets and boutonnieres and it was a big hit and provides a lovely, soft fragrance." Brides are opting for minimalist arrangements with high-quality statement flowers in low, opaque containers, inspired by traditional Japanese Ikebana arrangements. "We're finding lately that our brides are still wanting to create a lot of impact with their table centerpieces, but are moving away from taller arrangements that may block a guest's view," notes Hart. "We're creating centerpieces that are shorter in height, or opting for stands and containers that guests can see through across the table." Statement pieces like floral arches, flower walls and floral chandeliers will reign supreme in 2019. "Brides are wanting their weddings to be unique, and a signature flower wall photo backdrop or large flower hanging installation at the reception, are ways they can set their weddings apart from the rest," says Hart.